10 day Chitra Poornima (April-May), Surasamharam in Aipasi (October-November), 10 day Aadipooram (July-August), Vinayaka Chaturthi in Avani (August-September) Navarathri during September-October and all Saturdays during this period, are the festivals devotionally celebrated in the temple. 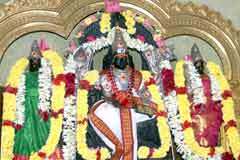 All the three Lords with their consorts – Lord Vishnu with Mother Mahalakshmi, Lord Brahmma with Mother Saraswathi and Lord Shiva with Mother Parvathi grace the devotees in the temple. 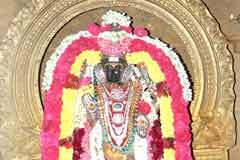 The temple is open from 6.30 a.m. to 1.00 p.m. and 5.00 p.m. to 8.30 p.m.
Sri Jalakandeswarar Temple, Fort, Vellore-632 001. Vellore district. Those seeking longevity, freedom from fear of accidents, for concluding marriages that are delayed and for the relief from jealous sight evils called Dhrushti. Devotees perform abishek to Lord and Mother offering Vastras. around the temple appearing as a garland. The circumference of this Agazhi is 8000 feet. 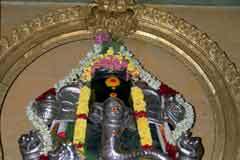 The sculpture in the wedding hall of the temple has two faces in a single body, an elephant and the bull. 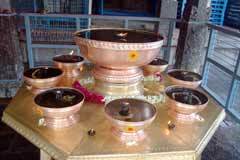 Water for the abishek of the Lord is drawn from well which is very old. 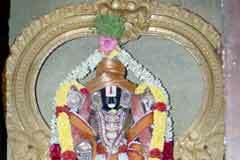 This is the Ganga Gouri holy theertham. The well has a natural spring in itself and not dug. 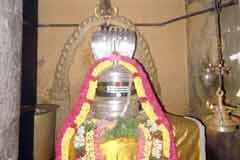 There is an earthern lamp on the Balipeeta behind the Adhikara Nandhi (the bull vehicle of Lord Shiva) which would revolve if some people place their hands on it as they wish it. But it doesn’t revolve in all the cases and till today nobody knows the reason. 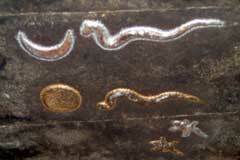 Those facing some troubles caused by lizards falling on them worship the Golden and Silver Lizards in the temple. 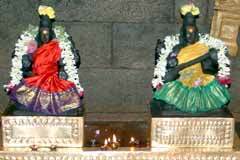 On the Kanu Festival or Mattu Pongal day (January), special abisheks are performed to Adhikara Nandhi. The wedding hall or the Kalyana Mandapam of the temple is as beautiful as the 1000 pillared Mandap in Madurai Meenakshisundareswarar temple. 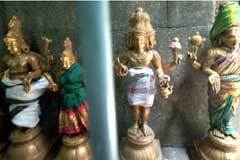 A torch called Navasakthi Jyothi is in front of the Goddess – Amman shrine. It never extinguishes and round in shape. 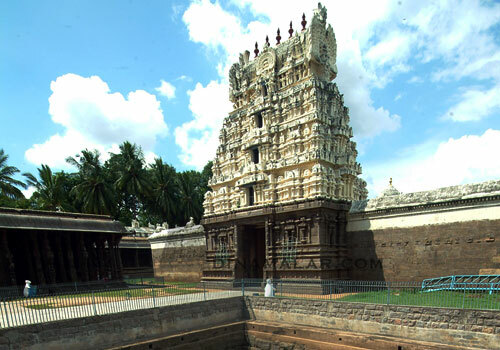 The main flame (jyothi) is at the centre and eight around it. A great lamp above the jyothi has a diameter of 27 inches representing the 27 stars starting from Ashwini to Revathi. This is called Star Deepa – Nakshatra Deepa. Hotel Darling Restuarant Ph: +91 416, 22213001, 2313005. Hotel Surabi International Ph: +91 416, 22216399, 22164999.